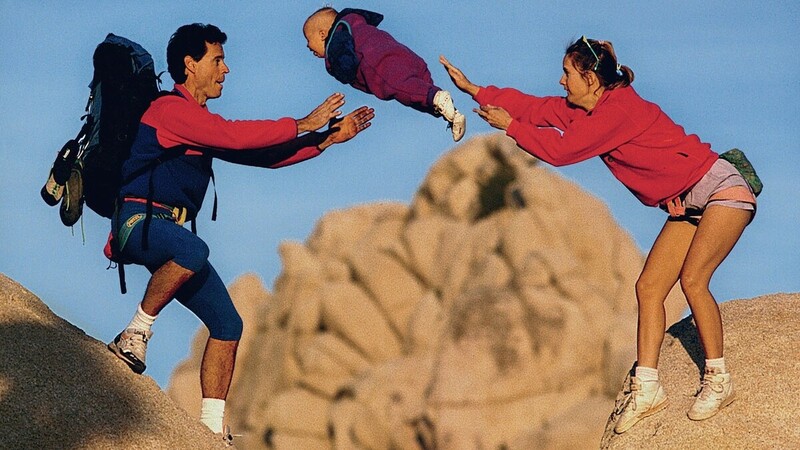 The Flying Baby From A Famous 1995 Patagonia Catalog Photo Is All Grown Up Jordan Leads lives in Las Vegas now and is studying to become a court reporter. An avid rock climber, Leads says she might want to re-create the iconic photo with her own child one day. Leads lives in Las Vegas and is studying to become a court reporter. She says the photo of her flying over a gap in the boulders was just one of many outdoorsy shots that hung on the walls of her parents' house, which also had a climbing gym that her dad built in the garage. "There's a guy that's juggling chainsaws, and I'm also being juggled," she tells Weekend Edition Saturday's Scott Simon. But her favorite edited photo is the one "where my parents are feeding me to a Jurassic Park dinosaur. I think that's the best." Leads says her parents surprisingly didn't get a lot of public scolding for flinging their baby over the rocks. That early moment of flight, along with her upbringing, seems to have stuck with her. She's now a rock climber and occasionally climbs with her father. Leads hopes to continue her family's value of the outdoors — and possibly re-create the photo. "I can't wait to show it to my kids one day and to show them how I was growing up, how my parents raised me and to really just bring that whole family value of going outside back to them," Leads says. "I would put [my photo] up on the wall, and then I could put my child's right next to it in our hallway ... I think that would be really cool."